Think about how much money your company spends on energy and utility costs. It’s probably a significant amount. Now think about the kinds of tools your company has available to help you proactively manage that spend. Unlike other areas of business in which technology and data play a leading role in driving efficiency and productivity, energy management is in the comparative Dark Ages. For years you’ve really only had two choices when handling the huge volume of energy bills across many different providers. You either just paid the bills or you hired a utility expense management firm to process them for you. In neither case were you creating a data foundation to build upon. Manual bill ingestion creates well-known data problems and makes it hard to do meaningful analysis. In addition, you didn’t have the right tools in place. Using custom spreadsheets, complex BI dashboards and reports (which are never as simple or as intuitive as they claim to be) means each project required lots of manual labor. At the end of the day, you want to be a champion – you want to drive meaningful change in the organization, whether it be by driving projects that save money or delivering on your company’s energy efficiency targets. Today’s technology aspires to do much more. By starting with a solid data foundation to deliver meaningful insights, modern energy technology can deliver true energy intelligence. New technologies within Web, mobile, cloud, big data, and AI combine to create better experiences across the board. It makes Energy Intelligence platforms possible. Energy Intelligence doesn’t restrict itself to paying bills. It puts you in the position to see the big picture, your entire energy profile and the various internal and external factors that impact your spend and strategies. Systems that start with a strong model of your enterprise data can do a lot more than just give you spreadsheets or dashboards. They can do deep analysis, connect with additional data sources, and generate meaningful insights that focus on the business tasks you need accomplished. And perhaps most importantly, these systems can do meaningful work for you through conversations – whether it’s crunching numbers, identifying anomalous situations that need attention, or telling you how to optimize your energy spend. 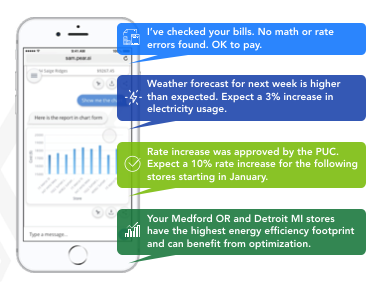 Think of it like Apple Siri, Amazon Alexa, or Google Assistant but deeply connected to your company’s energy profile. Investing in energy intelligence is a third option for managing your energy expense – and one that can deliver immediate payoffs. And yes, it can pay the bills. How much money did we save on our LED replacement initiative in our retail stores in the midwest? Which of our 250 locations had an energy cost increase over 30% last month? Which of my retail locations are currently using solar energy? I’ve checked your bills. No math or rate errors found. Ok to pay. Weather forecast for next week is hotter than expected. Expect a 3% increase in energy bills. Your company is searching for competitive advantage, finding new previously unforeseen ways of addressing energy needs, looking for cost efficiencies, and likely being measured by its carbon footprint and sustainability. With Energy Intelligence, you have an intelligent energy data platform and intuitive interface to support you in these efforts. Visit us at the EEI in Seattle 7-10 April 2019, booth 705.